It takes a unique site to produce a unique piece of architecture. So says Brisbane architect, Joe Adsett, whose Clifftop House at Teneriffe is nothing if not a one-off. When presented with a narrow band of clifftop overlooking the Brisbane River, Adsett found the architectural solution to be self-evident. The result is a stunning, three-level concrete-framed dwelling that sits lightly atop the cliff, affording magnificent views to the river and beyond. The Clifftop House actually shares its triangular site with an existing small brick cottage. But because the cottage was protected under local character regulations, demolition wasn't an option - nor was raising it to take advantage of the views. Instead, the owners decided to renovate and extend, utilising the small sliver of land between the existing dwelling and the cliff. Adsett and the client wanted to do something dramatically different to the old house, with the overarching brief being to get as much volume - and views - as possible out of the long, narrow strip. Constrained by height restrictions, they turned to concrete to deliver the solution. "Concrete allowed us to get maximum spans and keep the floor depths to a minimum so we could achieve three levels of living space," Adsett says. "The slab itself is impossibly thin and was only achieved by working collaboratively with 3D software." The spanning and strength qualities of concrete also allowed for a dramatic cantilever effect where the suspended floors come to a sharp, exaggerated point at the north-east corner of the site. Given its proximity to the river, you'd be forgiven for thinking this cantilevered form takes its inspiration from the bow of a ship. But according to Adsett, it was dictated more by the cliff itself coming to a point. The super-thin suspended concrete floors and vertical framing elements give the design a 'lightness'. Indeed, from below the whole structure appears to hover above the cliff. The off-form finish of these concrete elements is designed to complement rather than mimic the rock cliff-face, particularly over time as the material weathers. "Looking from below, yo see this weather rock cliff-face. We thought it would be too fussy for the hosue to have a pristine finish - we wanted to keep it honest," Adsett says. Internally, concrete wall sections have also been left exposed, as have sections of the slab underside as ceilings. These rustic, off-form features are juxtaposed with natural timber finishes and conventional plasterboard elements. Adsett says concrete has a genuine warmth when paired with the right materials - in this case, warm, rich timbers and cool whites. Despite its north-easterly exposure, the house is remarkably cool. A lap pool on the easterly edge enhances the cooling effect of breezes, while central voids funnel a stream of light into the interior and encourages cross ventilation. Bedrooms are split between the original house and the extension, with the family brought together in living areas on the ground floor and third storey - the latter opening onto a roof-top garden, complete with putting green. 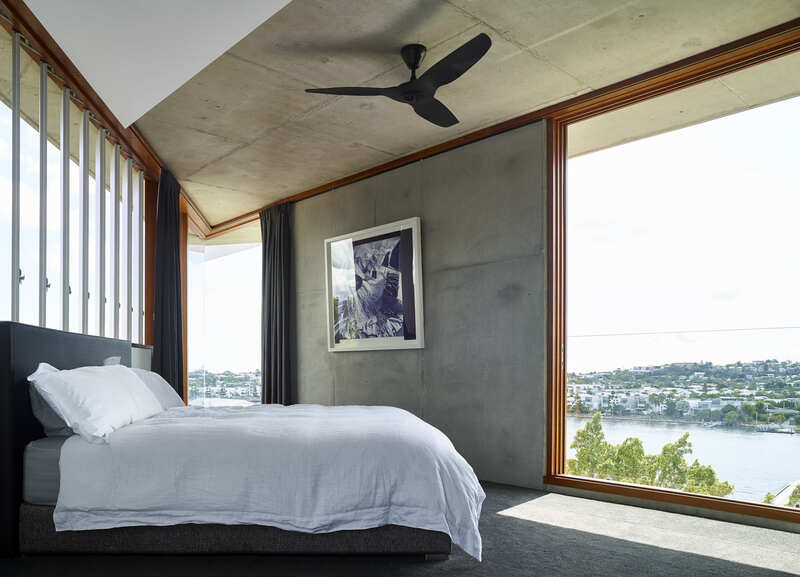 The first-floor main bedroom, the design of which follows the form of the cantilevered slab in the north-east corner, utilise timber louvres to control light and natural ventilation. The Clifftop House has quickly become something of a landmark - so much so, that the owners have to turn away curious locals who knock on the door, keen for a guided tour. Not surprising given the beauty, elegance and frame of the form.